Parking a car is difficult and expensive in Nashville, and nobody wants to drive to and from the action. ... and Stanza Nashville’s location is perfect for it all. 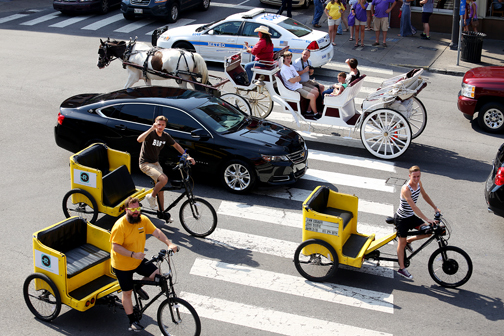 UBER, LYFT, Music City Trolley Hop and Circuit Bus, JoyRide Cart, or Pedicab. DON'T HAVE THE UBER APP? No problem. We have partnered with UBER Business to provide concierge assistance in ordering a driver and car, so if you don’t have an UBER account, your ride is charged to your room. Want something more Al Fresco? WE CAN SERIOUSLY USE "GOLF CART" TRANSPORTATION?? Absolutely. We wouldn't joke about hopping on this sweet ride. AND they're just around the corner! Flying in and want to secure your own wheels? No problem. You'll find what you need just a few steps away. YOU MIGHT BE WONDERING ... DOES THE HOTEL PROVIDE SHUTTLE SERVICE TO THE AIRPORT? No. See alternative options above. Or the good ole standby taxi cab. ... AND IS THERE A PARKING LOT? DO YOU HAVE HANDICAPPED-ONLY PARKING? No, but we offer valet parking for $20 a night.